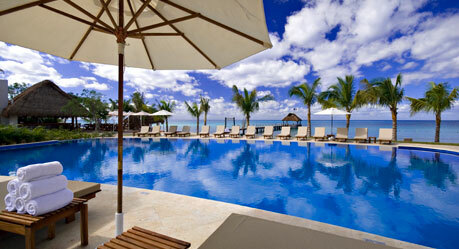 Unlimited Luxury, Aura Cozumel is the perfect getaway for couples, Honeymoons or a Spa Getaway. Enjoy a pool front walk out room or a romantic roof top terrace with plunge pool. Gourmet Dining and more. COZUMEL VACATIONS: Cozumel, Mexico vacations and all inclusive vacations packages by Cozumel vacation experts on Cozumel Mexico vacation travel. The island of Cozumel lies just twelve miles off the Yucatan Coast, a 45 minute ferry ride from the famed Riviera Maya. Dive into the crystal blue waters of Cozumel and discover why Jacques Cousteau called it the "best diving area in the world." Palancar Reef, the second largest in the world, provides an incredible diversity of species, stunning sites and visibility of at least 150 feet. Whether you're a first time snorkeler or an experienced diver, the intricate coral reefs and teems of painted fish will amaze you! IBEROSTAR COZUMEL The Iberostar Cozumel is a great place to get away and relax. 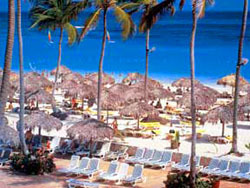 Loated near the Palancar Reef, this excellent all-inclusive resort is located on a great beach iin a lush tropical setting. Iberostar Cozumel features an enormous Lake Pool, lots of watersport, great entertainment & activities and an amazing staff to serve you. Book your Iberostar Vacation to and see why Iberostar hotels have one of the highest repeat guests returns in the industry. SABOR COZUMEL - Offering a lively setting ideal for fun in the sun, this family-friendly resort is a top pick for dive-enthusiasts of all skill levels. From the impressive secluded beach to the superior dive facilities, private pier, exciting kid's club, nightly live entertainment and daily theme parties, this resort ensures unforgettable vacation experiences at a great value. 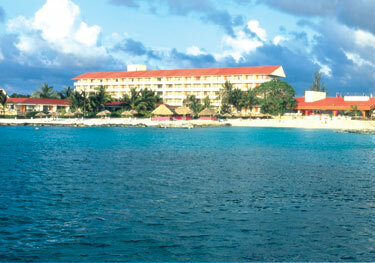 President Intercontinental Cozumel - the only resort in the area to receive the prestigious AAA Four-Diamond award. Guests can enjoy superb facilities, top-notch service from a friendly staff, fine dining and an exotic, private white sand beach, offering a variety of water sport activities. Description - On the beach, diving reef nearby, this resort is ideal for snorkeling with Chankanaab National Park close by. Facilities - Pool. Jacuzzi. Restaurants. Bars. Tennis. Watersports. Scuba diving. Gym. Safety deposit box. 24 hr. room service. 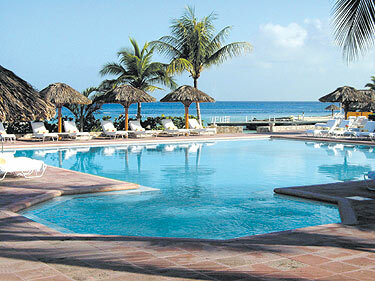 Reef Club Cozumel ~ Under new management, this is a great hotel for the diving enthusiast. Accommodation: Hotel Room, A/C, 1 king bed or 2 double beds, phone, TV, bathroom, pay-safe, balcony or patio with garden or pool view. Facilities: Pools. Restaurants. Snack bar. Bars. Tennis. Table tennis. Games room. Gym. Aerobics. Beach and pool volleyball. Dive shop and 5-star PADI dive center. Activities center. Kid’s club. Disco. Golf Special: Discounts available see page 7 and 8 for further details. Occidental Allegro Cozumel ~ A dream for water and diving buffs.This beachfront resort is close to the legendary Palancar Reef. Facilities: Pools. Restaurants. Bars. Swim-up bar. Whirlpool. Tennis. Dive center. Exercise room. Gift shop. Disco. bathroom w/tub/shower. hair dryer, in-room safe, balcony. Kids Stay Free: Kids 12 years and under stay and eat free when in room with 2 adults.Blackout dates apply.Special all-inclusive rates available during blackout periods. 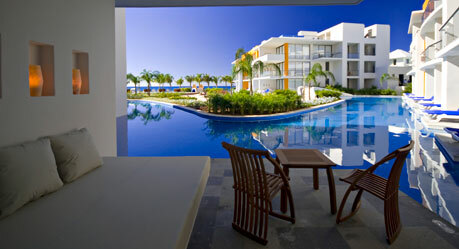 Park Royal Cozumel ~ BEST **FAMILY FRIENDLY** This 10-story hotel with expansive gardens and a large free-form swimming pool has a private underpass that leads to its own, secluded beach cove with calm waters. Accommodation: Hotel Room, A/C, 1 king bed or 2 twin beds, satellite TV, phone, bathroom with tub and shower, balcony with ocean, pool or garden view. Facilities: Pool. Kid’s pool with slide. Restaurants. Snack bar. Beach club. Lit tennis. Dive shop. Gym. Kid’s club and playground area. Gift shop. Safety deposit boxes at front desk. Beauty salon. Kids Stay Free: 12 years and under stay and eat free when in room with 2 adults Kids special: 13-18 years pay special rates when in room with 2 adults. speciality restaurant (reservations required), domestic drinks 7am –12:30am, day and night tennis, non-motorized watersports, supervised kid’s club (ages 4-12), daily activities, nightly entertainment, gratuities.